The Warrant List is a table of all Recorded Warrants. It also temporarily lists NX Warrants during the time they are in effect. You access the Warrant Table by selecting Warrant List from the Warrants menu of your Control Panel. For an overview discussion of Warrants, see Warrants. Warrant - The name of the Warrant. Route - The route of the Warrant is listed in a drop down combo box by clicking the table cell. Train Name - The Train ID, as stated in the Roster. This cell can be edited and its content is displayed next to the Indicator Track Icons when the train occupies their OBlock (the Edit popup of Indicator Track Icons have a checkbox to enable this function). DCC Address - The Address of the locomotive or Consist. This cell can be edited to correspond to the current motive power of the Train. Allocate - A button that reserves the route for the Warrant. The Indicator Track Icons display green to indicate the route. Deallocate - A button that removes the reservation for the Warrant. Set - A button that allocates and sets the turnouts for the Warrant route. AutoRun - A button that runs the train over the route according to the throttle commands of the Warrant. The recorded speed of the train will be modified according to the occupancy and signal aspects encountered on the route. The Indicator Track Icons display the current position of the of the train with a blue color. ManRun - (hidden column) A button that allocates the Warrant and sets the route for a manual operator to run the train. The script is not run, but the route is displayed. of the train with a blue color. Control/Status - The status of the Warrant is shown. It also has a drop down combo box that can send commands to a running train. Note: This column has two functions - Status messages and control buttons. When running, the Warrant will post a status message here; e.g. its current location and speed, error messages, etc. E-Stop - Issue an emergency stop to the train and suspend execution of the throttle command script. Abort - Abort the script and deallocate the Warrant. Edit - A button that opens an editing window for the Warrant. Just as when you created the Warrant, you may use your Control Panel to change the Track Icons that are part of the Warrrant. With every click, the total number of items in the indicator track items in the Warrant increases (or decreases when an already highlighted (included) icon is clicked. Delete - A button that deletes the Warrant. Note: Warrants can only be created if the PanelPro configuration has at least two OBlocks defined. Click in the table header to select columns to be hidden or visible. The following item are under the Warrants menu. Concatenate Warrants - Join two Warrants together to become a single Warrant. The last block and path of the first Warrant must be equal to the first block and path of the second Warrant. Create New Warrant - After providing system and user names this opens a blank Warrant Editing Window to create a new Warrant. The operations of this frame are discussed in Creating and Editing Warrants. 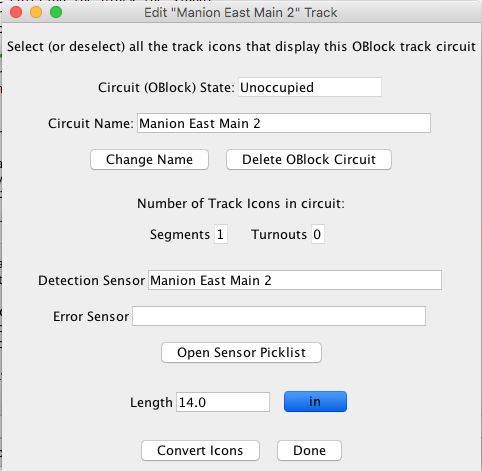 Train Trackers - Opens window where the identity of trains can be displayed as they move from one occupancy block to another. Create NX Warrant - Opens a window to create an eNtry/eXit Warrant. This is discussed in the NX Warrants Help. Open Session Log - Opens a window to name a file that records the Warrant and train tracking status messages to the file. The Create NX Warrant button Opens a window to create an NX (eNtry/eXit) Warrant. The Stop all Trains button causes all running Warrants to halt their trains. The Status field contains the last 20 messages from Warrants. Click in the field to display them. The throttle commands recorded in a Warrant are played back to run the train, but additional control of the train can be done through the choices provided by the Control/Status down down combobox. Note there are there ways to stop the train: Emergency stop, halt(stop), or ramp down to a stop and one command to restart it, keeping the Warrant in effect. Move into Next Block is "repair" command should the train overrun a block and become "Lost". This command aligns the Warrant to the next block and restarts the train. The Abort command does an emergency stop and annuls the Warrant. There are separate operations in the Warrant List table to reserve a Warrant route; (Allocate) and set turnouts for the route (Set). These operations do not have to be done to run an automated train. They are used to preview the route. An AutoRun operation can begin without them. The train will seek allocation and set turnouts as it proceeds on the route. As a safety feature, whenever a warranted train has permission to enter the next Block, the turnouts are reset to the route. Having permission from Signals should mean that resetting the turnouts does not interfere with any interlocking logic. "Stop" aspects of Signals, occupancy or allocation to another Warrant will deny permission. Only clearing the most restrictive of these conditions will give the auto-run train permission to proceed. When such a denial is cleared, the train will proceed automatically. The only thing that overrides automatically proceeding is if the user has set the control to "Halt". The train will not move until the user sets "Resume". When confronted with an occupied block, the train will stop and wait until the block clears. When the next block is clear but the block beyond the next block is occupied, the train will approach at reduced speed. Similarly, if the Portals have been defined with Signal Heads or Signal Masts protecting the blocks they join, the train will modify the speed according to the appearance or aspect of the signal. An automated train will attempt to secure allocation of the blocks ahead each time it enters a Block. It also checks whether the block is occupied by an unknown train and will not enter if the Block is occupied. When Warrant Speeds Are Modified has details about how Warrants modify recorded speeds. If a Warrant is started and the starting block is not occupied, the Warrant will wait until the block is occupied. When occupation occurs the Warrant will set to the "Halt" and wait for the user to set the "Resume" control. Note it is vital that the correct train occupies the starting block. The address specified in the Warrant, is the train that will begin moving.